Envelopes may be used for two reasons, either sending your first quarter grades (schools request it or you think it would benefit your application), or for your teachers to mail out your recommendation letter (ex. you applied through the SUNY app, or a private application. If you are confused as to whether or not you need to provide the college office, or your recommenders with an envelope, please come to the college office. Especially if you are unsure how to fill out an envelope! For Teacher Recommendations: Follow these directions. You will first fill out a large envelope with which school they will send letters to, as well as the deadlines for each school. Next, you will put a stamped, addressed, regular sized envelope for each school inside of the large envelope. That way they just need to place their letter inside and send!!!! 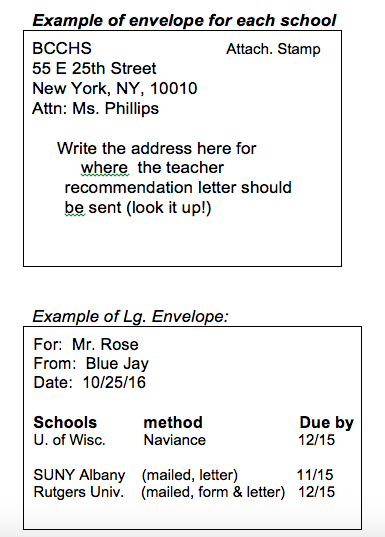 For your teacher recommendations follow the same steps as above, but you should use a regular size envelope with a forever stamp. SUNY Teacher Recommendation - If you completed the SUNY application, you should submit a regular sized envelope with a forever stamp. It should be addressed to the school you are applying, with the BCCHS address as the return address. The above information does not apply if you are using the Common Application, or an open screen icon appears next to the school you have listed on Naviance. Those applications will be submitted electronically through Naviance. At least 4 weeks prior to your first college deadline, list your teachers as recommenders on Naviance AND hand in the following to each teacher writing a recommendation. It is your job to look up deadlines and prepare forms and envelopes!! A large (9 ½ x 11) envelope. 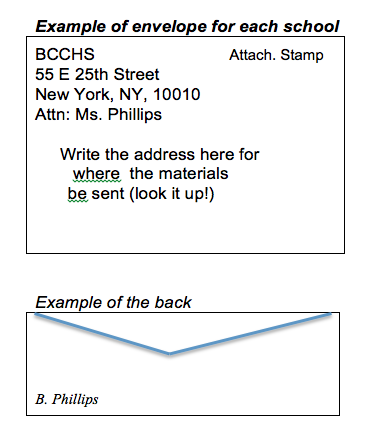 On the outside of this envelope, write the name of the teacher it is intended for, the student’s name and date. o HOW the teacher should submit the letter (Naviance or mailed). NOTE: for schools that only accept one letter, choose carefully which teacher you ask to write the letter and let BOTH teachers know who is submitting the letter to that school. For anything to be sent from college office. For example, first quarter grades, transcripts, etc. Please provide us with a stamped, addressed regular sized envelope to each school you would like materials sent. On the backside, please put your last name in the bottom corner. Submit to the College Office a large stamped addressed envelope with three 45c stamps, and put the school’s return address in the top of the left hand corner.